If you do not aim for the stars then you are wasting your life. 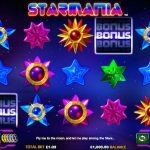 But it is still not late; you can try our latest addition coming from NextGen Gaming in a form of a video slot game called Starmania for a chance to change something in your life. You do not have to put too much effort here, just gaze at the beautiful symbols and click the spin button and be prepared for a win of a lifetime. The wild symbol in Starmania appears only on the second, third and the fourth reel. Its function in this game is to stand in for every other symbol except for the scatter to complete a winning line. 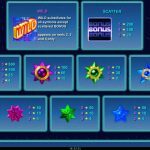 The blue bonus symbol is the scatter and it is the key to the main feature, the free spins round. The feature is activated by landing 3 or more scatter symbols for which you will receive 10 free spins. What makes this feature amazing is that before each spin an extra wild is added to the second, third and the fourth reel, and by the time you reach the last reel you will have 30 wilds in total. This sounds very promising we must admit. 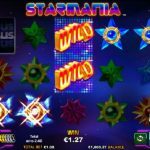 Starmania is a very simple yet entertaining game to play. But then again almost all the games that come from Nextgen Gaming are. We enjoyed our session and we can see that this game does not only have the looks but it also has the features. And after all, they are the most attractive part in any online slot. The fact that you have guaranteed wilds on the reels is amazing and they can pay really well. We had so much fun playing this game and we believe that if you give it a chance, you will too. For another great engaging game you should consider playing Spanish Eyes a 5 reel slot by NextGen.